Chop the potatoes in rough chunks of round about half a cm each. Heat a bit of olive oil in a fry pan and add the curry powder. Tip the potatoes in and stir to coat in the curry oil. Fry them for around twenty minutes or until golden brown. Finely chop the cabbage and the spring onions. Roughly chop the parsley. 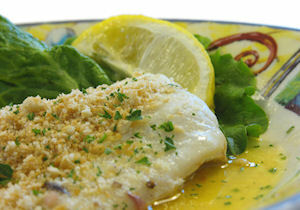 Once golden, tip the haddock into the pan and begin to break it up with your spoon. Add the spring onions and cabbage and cook for around five minutes to wilt the cabbage. Remove the pan from the heat and season well, then stir in the mayonnaise and chopped parsley.